How long until it is electric? Our hope is that we will have completed the conversion and ready to drive by the end of winter of 2010-11. It is a matter of time and weather at this point! 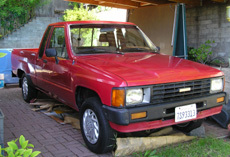 The red electric truck could be out on the road soon! 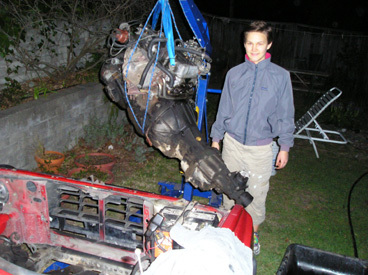 The picture above shows Ellen after a long day spent removing the IC Engine. What is so special about electric cars? very inexpensive to fill up your "tank"
Engine compartment with new motor! 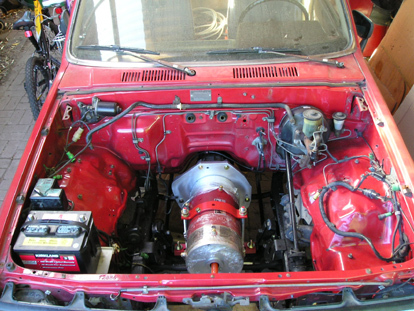 We added the Warp9 Motor to the cleaned transmission and installed it into the engine compartment on newly fabricated mounts. In this picture, Ellen is wrapping the wire bundle from the EV controls through the firewall to the dash. We just finished testing of several systems: contactors, DC-DC, Brake Suction, Charger. We're about to perform controller and traction motor tests. Truck is elevated so we can engage the rear end without going anywhere. But first we need to add transmission fluid and controller coolant, and find a way to tie down the 12 volt battery. Then we need to finish the short bed construction, rear bumper and lights installation. February 13, 2012. Just about one Year Later and we've driven 4000 miles in our new EV! Check out the Log page for more details.